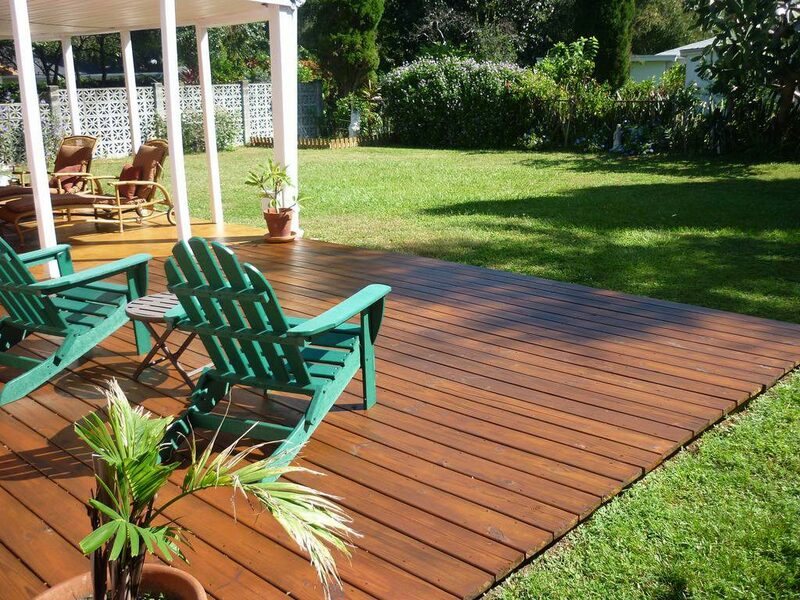 First and foremost, you’ll need to thoroughly clean your wooden deck to remove any dirt, dust and debris. A broom or leaf blower should remove most of the debris. Depending on the condition of your deck, you may also want to use a pressure washer (on the lowest PSI) setting to wash away stubborn dirt and debris. If your deck is wet, wait for it to dry before proceeding to the next step. Applying stain to a wet, or even slightly moist deck for that matter, is a serious mistake that should be avoided. Now comes the prepping. Since each and every deck is different, you’ll need to come up with your own plan of preparation. Ask yourself: which direction do I want to stain my deck? I recommend starting from the side against your home and working your way to the side facing your lawn. You obviously don’t want to walk over freshly stained areas on your deck, so create a plan of attack. Another important step in prepping involves taping the edges of your home where it meets the deck. No matter how hard you try to prevent it, you’ll inevitably hit the edges of your home with the brush. As long you tape it off with some thick painter’s tape, this shouldn’t be a problem. Line the base of your home with painter’s tape, paying close attention to the corners, and move on to the next step. The third and final step is to physically stain the deck. Hopefully, you’ve already chosen a stain product. If you haven’t, take a trip to your local home improvement store and look for an outdoor, waterproof stain in a color/tone of your preference. Pour some of the stain into a tray and use a push-brush to apply it to your deck. Apply a medium layer across the entire surface of your deck. When you are finished, let it dry for at least 48 hours before walking on it.